**This review was made possible by iConnect and Mr. Clean. I was provided the featured product and compensations to facilitate this post, but all opinions are 100% mine. I don't know about you, but the heart of my home, is the Kitchen. Everything that comes out of the kitchen is full of love, thought and hopefully, nourishment. Unfortunately, in order to pump out constant love and nourishment for my family, one big mess must be made. Especially when I have help from the wild-child toddler, or my husband. While FTD is a brilliant cook, he's not so great at cleaning up. Being that I have a busy, demanding schedule, sometimes, I decide that the kitchen is clean enough when the sink is clear of dishes and the counters are wiped of. Needless to say, it's not. So, I have a weekly routine that I do to reclaim the heart of my home, in about fifteen minutes! Oh, yes, my dreams are very big. But until that day beautiful day comes, I do my best to keep my little kitchen clean, and as functional as possible. 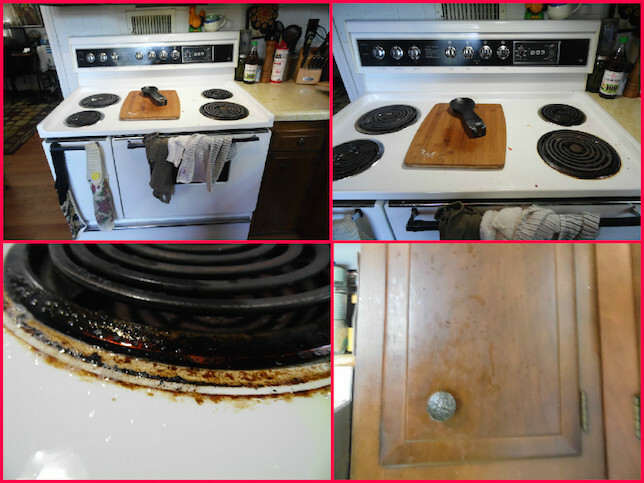 A big part of my weekly routine, is deep cleaning the stove (the true heart) and cabinets. I know, when I hear the words, "deep clean," I think of getting dirty making things clean, too. Well, not in this case, thanks to the help of my favorite house helper, Mr. Clean! Seriously, what did moms do before Magic Erasers? The number of times those miracle little pads have removed toddler mayhem from the walls, floors and TVs, is INSANE! Sorry, I digress. I JUST LOVE THEM! My stove... It's old, but very unique. It also is very large, and being that it's white, not only does it get dirty easily, it shows it! 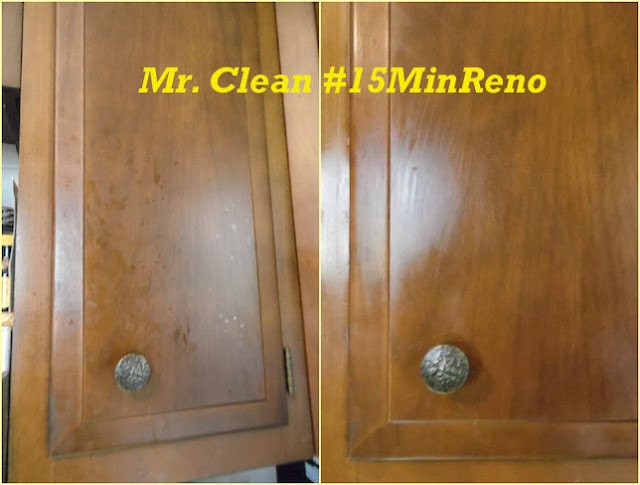 My cabinets are 1970 classics and show grime in the grossest way! I know I say it all the time when I talk about my Kitchen reno, BUT!, who puts a vent in front of a stove?! Talk about a pasta steam facial! So once a week, I fill the sink with a squeeze of Mr. Clean Liquid Muscle 2x and hot water. 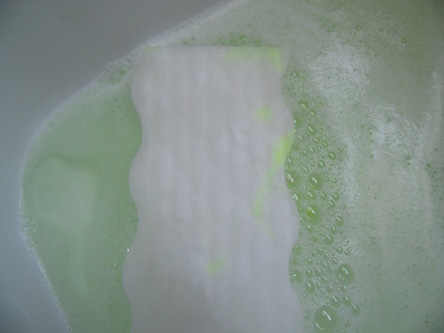 The soap is this super cool neon green. Something about the color just screams, GRIME I'M GONNA GET YOU! As if that's not enough awesomeness, it shines the chrome on my stove too! ALL IN ONE WIPE! I love that bald man. FYI: Here is a close up of a small squirt of the Mr. Clean Liquid Muscle 2x, allowed to penetrate for a minute, and then BOOM! 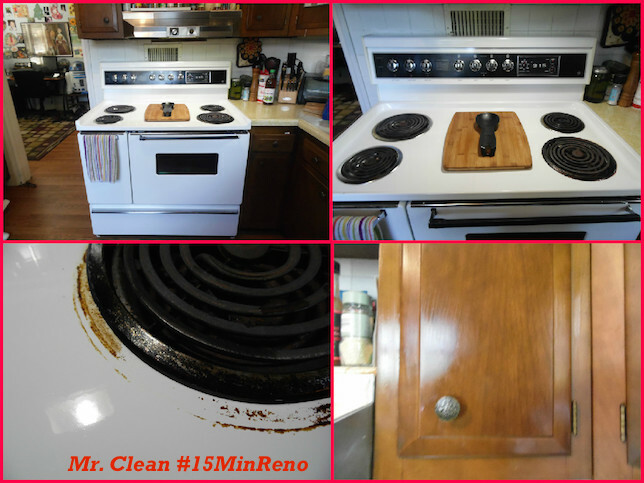 one wipe with a clean Magic Eraser Extra Power, and my stove looks 1970's brand new to match my 1970's brand new cabinets! Already thinking about your hidden grime, and how you've neglected it? It's OK, we all do it. TIP: Getting into a weekly routine will help make "deep" cleaning a breeze! 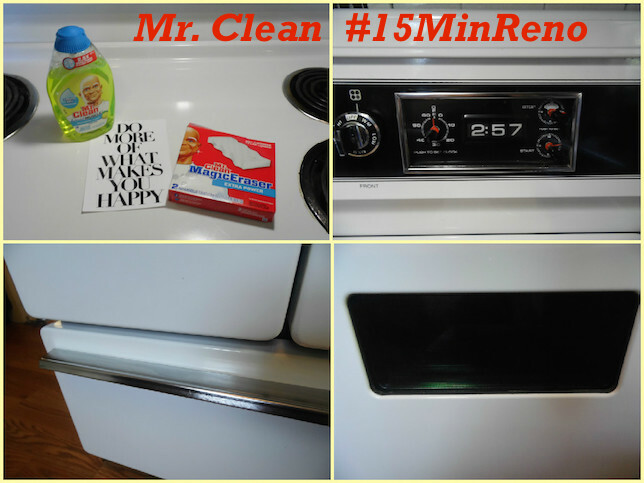 Want some more awesome #15MinReno ideas? 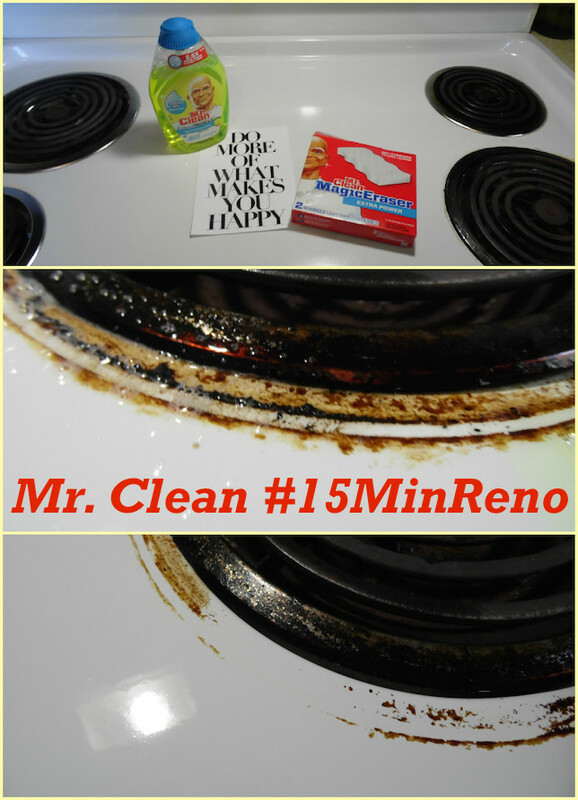 Join the Mr. Clean #15MINRENO Twitter Party with Celebrity guest, Johnathan Scott of HGTV Property Brothers! You can win some awesome prizes too! 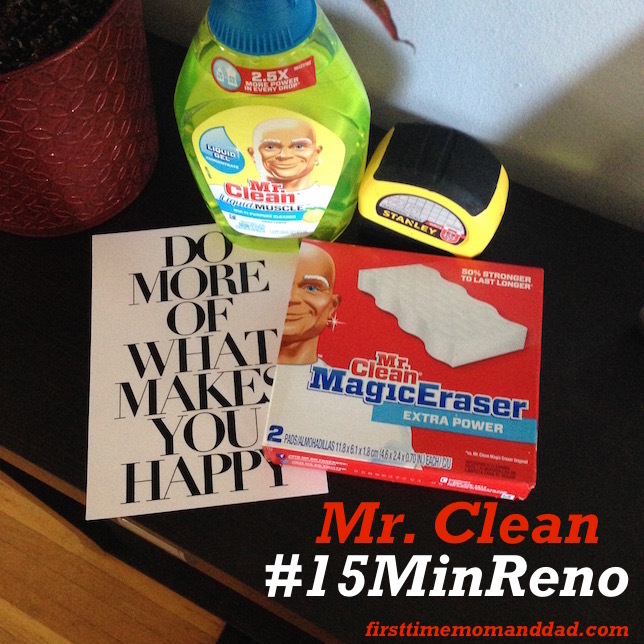 Now your turn, how has the Magic Eraser made your life easier and #15MinReno a breeze? Do you have plans for a home reno project? Or do you need some inspiration? Connect with Mr. Clean on Facebook and Twitter!